This was a beautiful novel. It was neat that I could connect to the main character, Kit in a way. We're both adopted and I'm so grateful for the parents that have adopted me. I haven't read the first and second one of this series because I didn't know this was a series but I plan to get them the next time I come across them. This was such a beautiful book about having faith, hope, charity and asking and giving forgiveness. The ending was perfect. I loved this book! Choosing Charity is the perfect conclusion to the Faith, Hope, and Charity series. It brings together all the loose ends of Kit's story and completes the development of her character. However, I think it can also stand on its own as a beautiful story of love, family, and of course, charity.Which brings me to one of the things that I loved about this trilogy, and that is its overarching theme of "faith, hope, and charity". As Latter Day Saints, this phrase is used over and over as qualities that we should be seeking to cultivate. I loved watching as Kit developed these qualities and realized the importance of each of them in her life.I especially loved the title of this final book! Not only does it convey the message and theme of the book but it has a special double meaning since "Charity" is also the name of Kit's half-sister. And since "the greatest of these is charity" (1 Corinthians 13:13), it was a fitting theme and title for the conclusion of this trilogy.Terri has once again created a truthful and heartfelt story of family drama. I like that she doesn't shy away from dealing with tough subjects such as divorce, adoption, and infertility. 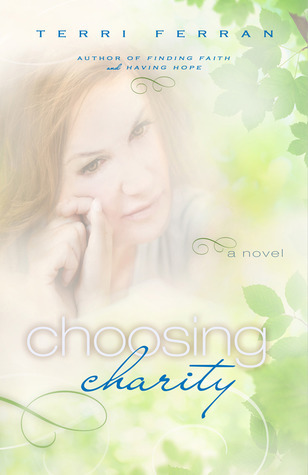 Instead, these are woven into the story and dealt with in a realistic way that I am sure many people can relate to.Choosing Charity is a well written, moving, and genuine book about families overcoming their differences and learning to show compassion for one another. It is a great LDS contemporary read and a perfect ending to Kit's journey. The ending to Kit and Adams story was completely unexpected. I was drawn into the characters and their personal struggles. There were twists to the story that brought happy changes and some unique situations. Well written story. 3.5 stars.What a fascinating book. Choosing Charity covers everything from a woman trying to forgive both her adoptive parents and her birth mother, to the miracles and tragedies one witnesses when one comes across the terminally ill (and no, it doesn't play out how you think it will). Rest assured, you'll be wanting even more by the time the book is through.I liked the characters in this story, and was interested to see how things played out. One of the strongest points in the book is the relationship between Kit and her husband, Adam. They have an open relationship that allows them to help each other through the hard times they face in the story. I was enamored with how much they love each other--being patient and forgiving, even while the other person is being unreasonable.On the opposite end, I was shocked at the relationship between Kit and her birth mother. I don't want to spoil anything, but it was just not what I expected. Though, it made complete sense, and I was fascinated as I witnessed their relationship evolve throughout the story. It definitely made for a different story than I expected--which is exactly what I liked about it.One thing I didn't like--and the reason behind my rating--is that I felt too many of the details were glossed over. I would have liked to have known more of the events that transpired between Kit and other characters at key points in the story. The book covers many months of Kit's life (close to, or more than, a year), so I understand that some things had to be skipped, but there were many jumps in time that were quickly told in retrospect--especially times when Kit was the most frustrated--where I was most interested in hearing the details.Overall, Choosing Charity is a unique family drama. It's got a focus on family relationships, and gospel teachings, and is definitely worth a read.Read this if:...you love family drama, and you believe in strong family relationships.Content Warning*This section may contain some spoilers about content! *(view spoiler)[Chaste kissing, pregnancies, and multiple discussions of hard topics having to do with motherhood, abandonment, death, illness, etc.. (hide spoiler)]This review was originally published on my blog: The Reading Fever. *I was given a copy of this book, in exchange for an honest review. I loved the characters in this book. I haven't read the other books in this series, but I will be going back and reading them. Now, with that said, this book worked very well as a stand alone read. I loved the main character's fun and quirky personality. You come to figure out that her past experiences contribute a lot to how she reacts to things. Another thing I wanted you to know, this was yet again a book that was a quick read. I didn't want to go to sleep, and I stayed up late...ON a school night...to finish this book. This has been happening a lot this summer. I chalk it up to reading many great books by awesome writers!! This book has a lot of heart. It will pull at your heart strings. It will make you think "what if...". Some of the subjects in this book are adoption, abandonment, infertility, organ donation and emotional healing. Some things are quite controversial. Terri Ferran does a great job in the way she covers all of these tough subjects. My favorite characters have to be Kit and Charity. The interaction between these characters made me LOL and cry. I truly felt empty after finishing this book because I missed them and their conversations. This novel is about what could happen to real people, in very real situations, who turn to family and God to make it through their tough times.Overall I loved this book. I truly like Terri's writing style and want to read more of her books. Add this book to your summer reading list. I know that it is probably full already, but you won't want to miss this very moving story. This is the third and final book in the Faith, Hope, and Charity series. You do not need to read the first two to enjoy this book, but they help you understand how Kit and her husband Adam met and gives you better input on those people in her life. The first two books are called 1. Finding Faith 2. Having Hope I have to say that this was definitely my favorite in the series! Kit has really grown since the first book but still has many unexpected surprises still ahead of her that are brought forward in this last one. She faces her parents sudden divorce and juggling relationships with both and their changing lives. Also the fact that her biological mother finds her after all these years and it's not how Kit planned the meeting would go. Of course Adam is the perfect husband who helps her look past all the negative that's creeping up and brings in the positive. She also has great support from his family and their friends. I loved how Terri tied in the word "Charity" and used it in a couple different ways. It was truly an inspirational read! It had love, drama, heartache, laughter, and of course Faith, Hope, and Charity. Family is a powerful thing and these books hold to what it means to be one. To be there for one another, no matter the circumstance. Love never dies.Read all three books and get the know Kit, Adam, and the rest of these fun characters Terri brought to life through her writing. This book was a pleasure to read. It has an emotional pull that keeps you invested and reading. There were so many personal and stressful things happening in Kit's life yet I think they were represented in a way I could relate to. They seemed real to me. Well, except I can't imagine how I would deal with meeting the woman who gave birth to me and left me in a dumpster to die. I'm pretty sure it would have taken me longer to get over the "meeting" event than it took Kit.I think the best part of the book for me was the growing relationship between Kit and Charity. It was easy to see how love for one person can trump anything negative about a situation. I also love how the title can be taken literally and figuratively. I love the messages in this book. Forgiveness, hope, faith, charity and love. When the family rallied around Kit and Charity my heart just swelled. I finished this book feeling good.This book is the third book in a series about Kit. I haven't read the first two books (Finding Faith and Having Hope) but I had no problem reading this as a stand alone book. I didn't feel lost or out of the loop at all. Having said that, I would like to go back and read the first two books. I'm sure they are great as well.This is an LDS fiction book. This book provides a great ending to a series that I have enjoyed very much. I hate to say goodbye to Kit and her family. I've enjoyed getting to know them and empathizing with their struggles. In this book, Kit struggles with her adopted parents divorce, but in addition to that is the shock of her birth mother suddenly wanting to see her. Once again, Ferran creates a believable and tender story of love and family and forgiveness. The struggles that Kit goes through in this book are truly heart-wrenching. I found myself angry and sympathetic in turns. The characters just felt so real to me as did the settings and storyline. The strength of this series though is the characters and their choices and struggles. Not only is the book full of heart but plenty of humor as well. There is religious doctrine included in this book (Kit is a Mormon, a member of the Church of Jesus Christ of Latter-Day Saints), but it flows so well and is such an integral part of the story. I highly recommend this series to those who enjoy stories with a lot of heart. Good, clean, interesting book. LDS. I liked it. I just found out, after reading it, there are 3 in this series. This one is the third. The editing was terrible in the ebook I have. great story of forgivness. From the book: Kit's finally married! But just when everything seems perfect, Kit learns that her birth mother---the one who left her in a dumpster twenty years ago---needs her help. Can Kit learn to forgive and let go of the pain in her past? Expertly written and full of heart, this captivating conclusion to the Finding Faith trilogy will delight fans of all ages. I had a hard time deciding between 2 and 3 stars for this book because it was a good story, but there were some bothersome things about it. The main character, Kit, is such a whiner. She gets mad over the silliest things and just almost seems unstable sometimes. It made me wonder how her husband could deal with her half the time. So I think I just mostly got annoyed over Kit's constant complaining and that took away from the good things about the book. A nice little ending to the series, leaving everything all wrapped up with a nice little bow.. I haven't read the other two for awhile, but I didn't feel like I was lost. Kit is now married and her birth mom suddenly appears in her life, bringing a fun surprise into the picture. A lot of LDS content, but I didn't feel it was preachy. This was an easy, quick read. Witty dialogue. Typical LDS novel type-of-ending, but one of the main characters didn't seem real to me. Nice ending to this trilogy. Easy read and I was surprisingly moved by the story.